E-Panel Lite - For use with TraceSW, DR, RS etc. The MNDC Plus version of the popular MNDC adds another din rail allowing up to ten din rail mount breakers. Two din rail cover plates and two panel mount plates are included. The panel mount plates allow for mounting the 3/4" 125VDC breakers that range from 60 amps to 100 amps. You can also fit the MNDC-GFP80 plus four more panel mount breakers in the enclosure. Another configuration would be one MNDC-GFP, one 3/4" panel mount breaker and five din rail breakers as well as the large 125-250A inverter breaker. Mounting is provided for a 500 amp shunt and a MNTBB-R terminal bus bar. Battery negative stud is included as well as a ground busbar. The MidNite Solar 115V Surge Protector Device (MNSPD) is a Type 2 device per UL1449 rev3 and has an outdoor rating of 4X for outdoor use. Protection for battery circuits. The MidNite Solar 300V Surge Protector Device (MNSPD) is a Type 2 device per UL1449 rev3 and has an outdoor rating of 4X for outdoor use. Protection for Classic and other charge controllers, off grid PV combiners and 120/240 VAC circuits. 150VDC din rail mount breaker available in 1 to 63 amps (13mm wide). 80 or 100 amp Din rail mount breaker. 63 amp 150VDC din rail mount DC ground fault protector (NRTL listed breaker assy). NEC2008 requires DC-GFPâ€™s on all solar installations. 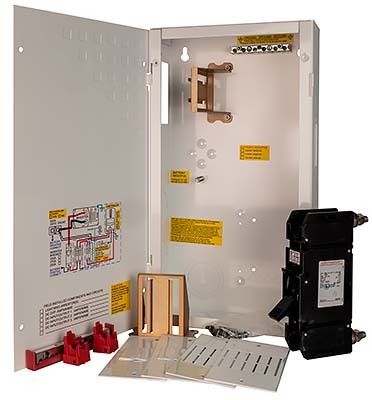 80 amp 150VDC panel mount DC ground fault protector (NRTL listed breaker assy) 1/2 amp trip mechanism connects between battery negative and earth ground NEC2008 requires DC-GFPâ€™s on all solar installations. Shunt - This is the industry standard shunt. Four 1/0 & eleven #6 useable wire slots. 180 amps. Comes with two lengths of 10-32 screws. Both copper and aluminum wire is acceptable for use with these busbars. These BUSBAR INSULATOR COVERS help protect from accidental shorts.